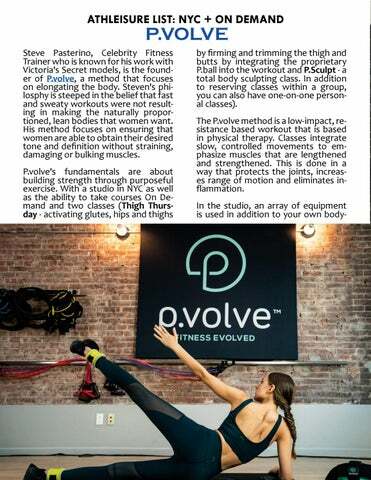 Steve Pasterino, Celebrity Fitness Trainer who is known for his work with Victoria's Secret models, is the founder of P.volve, a method that focuses on elongating the body. Steven's philosphy is steeped in the belief that fast and sweaty workouts were not resulting in making the naturally proportioned, lean bodies that women want. His method focuses on ensuring that women are able to obtain their desired tone and definition without straining, damaging or bulking muscles. by firming and trimming the thigh and butts by integrating the proprietary P.ball into the workout and P.Sculpt - a total body sculpting class. In addition to reserving classes within a group, you can also have one-on-one personal classes). The P.volve method is a low-impact, resistance based workout that is based in physical therapy. Classes integrate slow, controlled movements to emphasize muscles that are lengthened and strengthened. This is done in a way that protects the joints, increases range of motion and eliminates inflammation.